Proposed plan for earthbag roundhouses in Honduras. “Greetings! I am reaching out to say hello as a fellow earth builder! I have looked through the Earthbag Building.com site and even downloaded your PDF book a few years back. Excellent resources! I also wanted so share my project. I am from Connecticut and was working in Honduras as an English teacher from 2012-2014. While I was there I used Kaki Hunter’s earthbag building book (along with some tips from yours) to create a test dome. The project was to see how the whole earthbag building works and to see how it would hold up in Honduras. Well, it’s been two years almost since we finished and with zero maintenance the dome is still going strong! Incredible. I have been working with some Honduran architects to design a cylinder house (you can see them in the gallery in the link below). 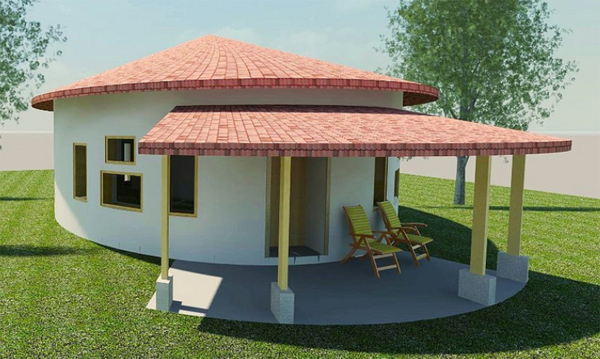 The first cylinder home will be an inexpensive home that I hope to build as a study to see how economical and sustainable the home is to build in Honduras. If all goes well, eventually the plan is to build homes to help fight the 1million+ housing deficit in the country. At this point I am finishing up project plans and will be looking for funding in the upcoming year to prepare for the construction. Very exciting! I am looking to buy land in Roatan and need to keep the building costs down so these houses are just perfect. Is there anyone doing these type of builds out there?